Winds packing 160 miles an hour were already lashing the US islands as Maria barreled westwards, forecast to make landfall before heading to Puerto Rico. St John Island, United States: Hurricane Maria closed in on the US Virgin Islands Today as the US National Hurricane Center warned of a "potentially catastrophic" impact from a storm that has already killed at least two people in the Caribbean. Winds packing 160 miles (255 kilometers) an hour were already lashing the US islands as Maria barreled westwards, forecast to make landfall before heading to Puerto Rico. "Very violent and intense right now as we have just begun to experience hurricane force winds," said 31-year-old Coral Megahy late Tuesday, as she hunkered down on St Croix. "We can hear debris banging on the aluminum windows as well right now." 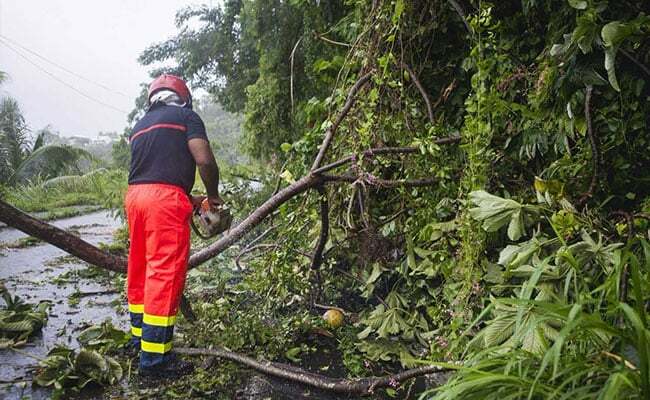 On St John Island, locals reported seeing trees swirling in the wind, with rain coming "sideways" as Maria continued on its path of destruction after battering the island of Dominica and other territories in the eastern Caribbean. Judi Buckley, former senator for St Croix Island, traveled to St John from her South Carolina home to help with the Irma relief effort -- only to get caught up in Maria. On neighboring Dominica, premier Roosevelt Skerrit posted on Facebook that there were initial reports of "widespread devastation," with official communications to the island completely cut off in the wake of the storm. "We are planning for the unexpected, we are planning for the worst," said Chris Austin, head of a UK military task force set up to deal with the aftermath of Irma. France said 110 more soldiers would be deployed to the region after widespread complaints of looting and lawlessness on St Martin after last week's storm.